Puns, I’ve discovered, are rather hard to avoid when writing about fish, so I’ll do my best not to use the most deliberate of gags. We visited this new Ramsgate restaurant on a Friday lunchtime wishing for greatness but anticipating some teething problems at the very least. The warm interior gives a tasteful nod to the sea and has diners seated upon reclaimed church pews whilst they consume the holiest of creatures. Staff display just the right balance of friendliness and professionalism to make you feel comfortable yet reassured. The standard fish and chip menu is an extensive affair and that’s before you’ve even cast an eye over the rather interesting specials page. All of which came as a surprise to me due to the lack of a working website – page 1 stuff surely? Ordinarily I’d opt for the obvious but decided to plunder the specials instead. I could have cried as I watched plate after plate of fish and chips (£8.00+) teasingly pass by. What had I done? My neighbours happily taunted me with conversation of perfect batter, amazing chips and just so mushy peas. I was a broken man. The gorgeous bread brightened my spirits a little, a mountain of spicy whitebait (£4.95) almost brought a smile, and would have, had it more of a kick and something to dip it in. A lemon aioli perhaps? And then a beautiful thing happened: my main course arrived. 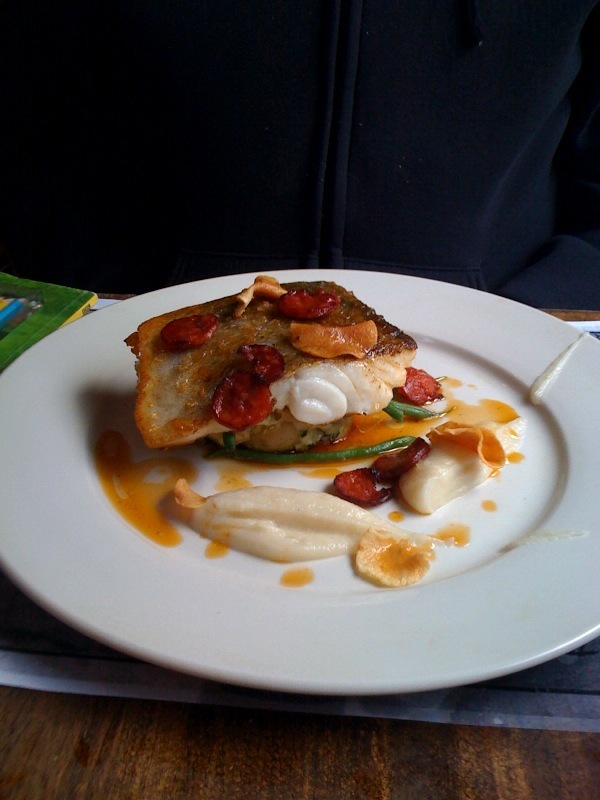 An epic slab of cod with chorizo and artichoke puree (£14.00) It was superb. I wanted to stand on my chair and celebrate. I’d won the Battle of the Lunches. My adversaries lay slain across my new favourite restaurant, weeping into their ketchup-stained napkins. Who needs batter when the fish is this good? Not me. Well, not today anyway. I’m hooked (sorry). 32 King Street, Ramsgate, Kent, CT11 8NT, 01843 852123.